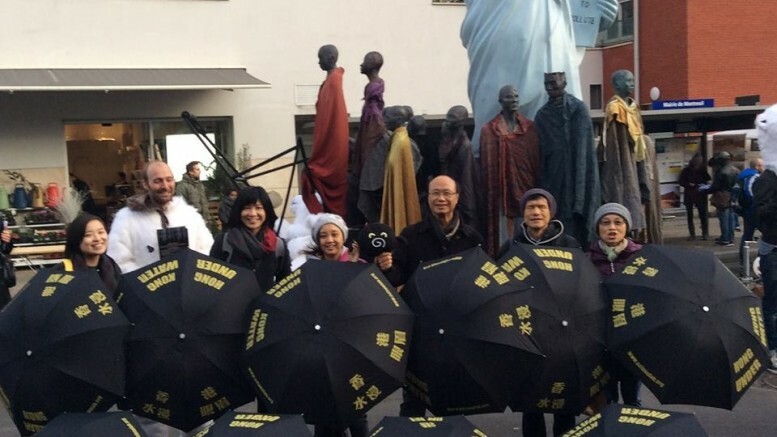 Delegates of Hong Kong NGOs attending the Paris Climate Talks call for action on climate change. There is optimism here in Paris that we will achieve an agreement on climate change which will, for the first time, commit virtually all the world’s nations to a combination of binding and non-binding actions on greenhouse gas emissions. There is little optimism, however, that the agreement will go far enough to ensure that we hold the warming of the planet down to two degrees, let alone the 1.5 degrees that many, including the vulnerable small island nations, think is essential to their survival. Arguments about the precise wording, about who bears the cost and the liability will doubtless continue to the eleventh hour. Inside the conference centre – passing the country pavilions showcasing national green policies, the business exhibitions displaying reduced-carbon practices and environmental technologies, the hundreds of talks on environmental improvement, and the NGOs and academic institutions pouring fourth research reports on all details of climate change – it is easy to be falsely reassured. The first false impression is that in all corners of the world, all sections of society are concerned about climate change. Despite the climate frenzy in Paris, recent surveys show that that concern about climate change in most countries has declined. A GlobeScan survey at the start of this year showed that in only four of 20 countries studied does the majority of the public feel their leaders should take tough action on climate change, down from eight out of 20 at the time of Copenhagen talks in 2009. Second, one can easily form the impression that from the biggest nations to the smallest company, everyone is doing something about greenhouse gas emissions. Yet behind the recycled wood façades of the temporary country and company pavilions presenting their glossy brochures on eco-cities, we know that austerity policies, powerful oil and energy company lobbies and political quick wins still drive a whole lot of decisions. Governments around the world are still moving ahead with carbon-intensive projects that lock us in to decades more greenhouse gas emissions. Green organizations, indigenous people proudly asserting their cultures, and particularly groups of young people, are continuing to push the negotiators with placards, die-ins and other small demonstrations both inside the conference area and around Paris. Sometimes with tears of intensity in their eyes, and sometimes with smiles of solidarity, young people are connecting to other like-minded activists from all over the world who share their vision of the future, and a common willingness to spend a good part of their lives working towards a greener world. It is clear from the social media that for each one of those young people who managed to find the fare to Paris, there are thousands more who are equally passionate about protecting the planet. This is heartening, because we need people with decades of energy ahead of them, to ensure that a moral force and a generous vision prevails over political and economic short-termism. It is young people who have much work ahead to ensure that (to borrow a quote from another time of crisis) the Paris agreement will not be the end, not even the beginning of the end, but perhaps the end of the beginning. Be the first to comment on "The End of the Beginning: A Call to Youth"